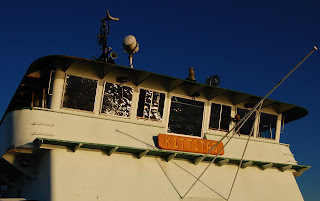 The M/V Kittitas is a Washington State Ferry that usually plies the Mukilteo-Clinton (Whidbey Island) route. It's one of the six Issaquah class vessels, and was built in 1980 (on the Duwamish waterway) by the Marine Power & Equipment Company. The company has since bankrupted and ceased operations. It is handsomely featured on the cover of the menu for Ivar's Mukilteo Landing Restaurant!